-	Off-court character movement is still a bit off. This. Is. Basketball. The NBA 2K games have been around for twenty years now, and each year the game slowly comes closer to becoming the perfect NBA basketball simulation a fan could want. 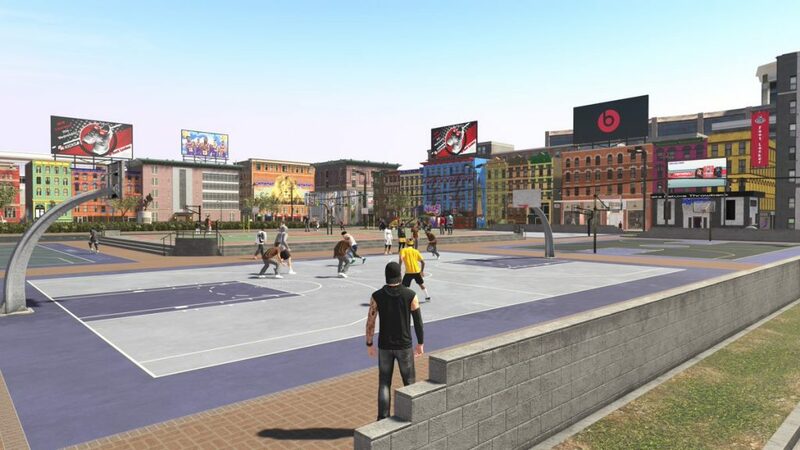 This year, NBA 2K19 continues to build on what 2K18 presented, with an all-new open-world online neighborhood to explore, an extensive MyCareer mode including a five hour long cinematic prelude with cutscenes as long as 30 minutes. 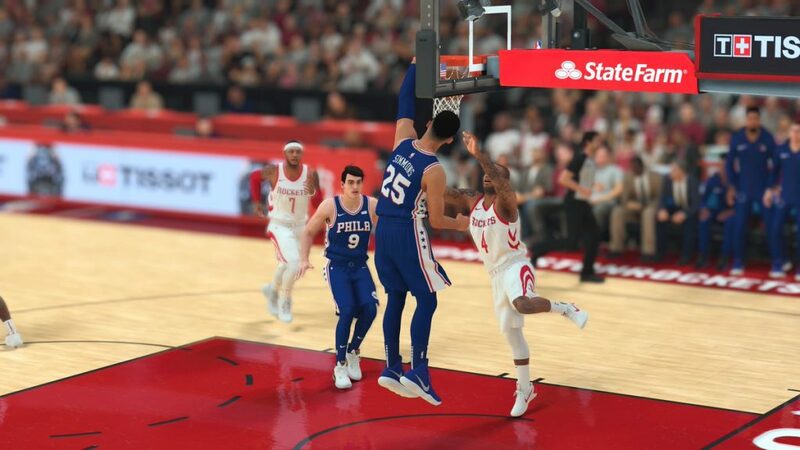 With more character animations, variations in crowds, and the new Takeover Mode changing the way you play, and for the first time an Australian, Ben Simmons, featured on the ANZ Standard Edition, NBA 2K19 could be the complete package you’ve been waiting for. From the main menu, you’ll find Play Now which includes everything you desire if you want to jump in to a quick game, ranging from offline games of current, historic and all-time teams to live teams that are up-to-date of today’s lineups. You can also quickly jump in to online matches and rank your way up through the leagues, earning trophies and maybe eventually becoming the G.O.A.T. Play Now also offers 2KU where you can train and hone your skills, and the new Blacktop mode giving you the opportunity to play 1 on 1, 2 on 2, all the way to a normal 5v5 street match. Lastly, there’s also a Play with a Friend menu option where you can quickly lobby up with someone on your friends list to play with them in various gameplay modes. Scrolling to the right, you’ll find the paramount MyCAREER mode which we’ll get in to greater lengths below, MyTEAM mode which allows you to pick and choose your favourite NBA superstars and then compete online for the chance to win real-world cash, MyLEAGUE mode which continues to be a customisers dream, offering the abililty to change every aspect of your custom league over an 80 year lifespan. Here you’ll also find the MyGM mode, where you can take a ringside position in guiding your favourite NBA team to glory, as well as other modes including an upcoming “Start Today” selection which unlocks on October 17, 2018. Lastly in the main menu, fans can kick back and watch some episodes of 2KTV or explore other options and features in NBA 2K19. This is where you’ll find a neat little shoe creator. Yep, you heard that right, you can create a shoe from the ground up (pun intended), and it’s not just a simple customiser either, this create-a-shoe feature gives you more options than some racing games do on car customising. 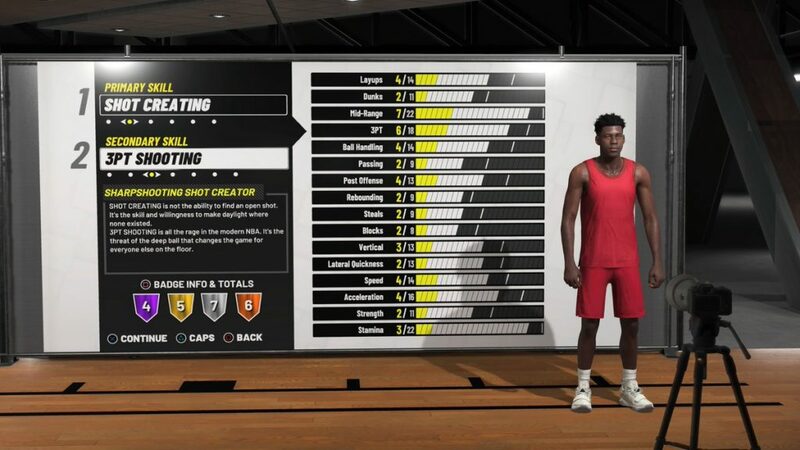 In the features you’ll also find all the necessary create-a-player tools to create anything your heart desires; there’s even a new DNA option that allows you to create Michael Jordan circa 1997 or Shaq circa 2001. MyCareer mode continues to be one of the most extensive sporting careers you can have in a video game, and this year the prelude alone lasted for several hours, including traveling from America to China then back to America again where your character (cleverly nicknamed A.I.) finally lands a dream NBA match for the Lakers ahead of beginning the actual NBA 2K19 MyCareer and gaining access to the neighborhood. 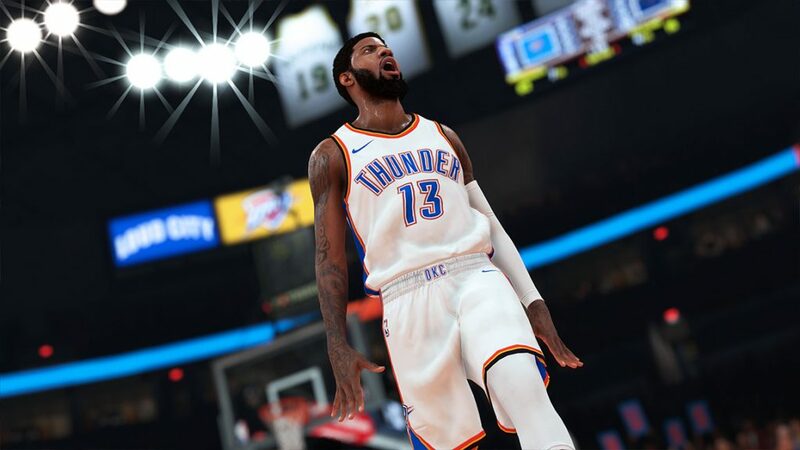 Though it’s possible to skip most of the features in MyCAREER mode, with even the regular season matches able to be simulated, there’s enough content in there to give fans something to do for the rest of the year and perhaps until NBA 2K20 releases next September, unless you decide to purchase the virtual currency, but we’ll explore the pay-to-win features a little later in the review. 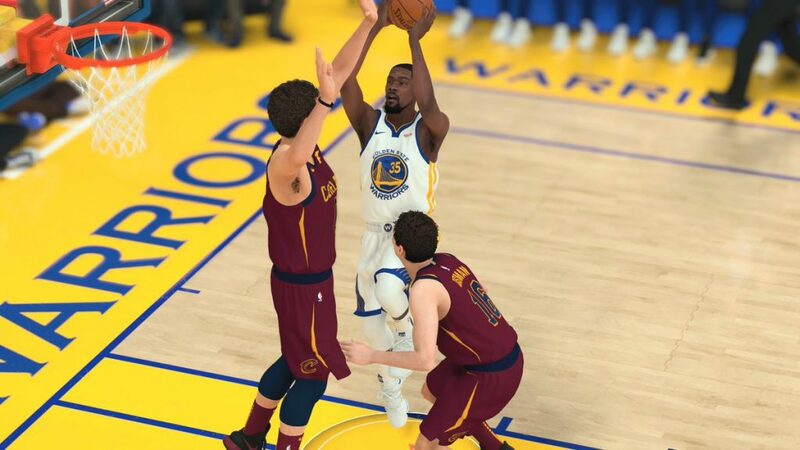 Gameplay in NBA 2K19 hasn’t changed much since last year, though over the years 2K has worked on refining it to a point where it’s about as close to the real thing as you can hope. Gameplay animations continue to surprise us, as players celebrate and chuck tantrums in different ways depending on not just how the game is going but also based on the real-world player and how they act in real life. Each NBA game can be played as simply or as in-depth as you want, with on the fly substitutions, positioning and other coaching features, NBA 2K19 is capable of offering something for every type of NBA fan. The main new aspect of actual NBA 2K19 gameplay is the ability to build up a Takeover bar to the point where you can activate Takeover Mode. This new mode gives you temporary increased stats and might be the difference between a steal and a foul or making a 3 pointer on the buzzer. Building the meter is achieved by playing smart basketball, scoring and assisting, and as you build the meter you can activate Takeover Mode for just yourself, or you can try to continue building the meter and activate it for your entire team. Don’t expect to just become LeBron though, as the temporary increase isn’t huge, just enough to gain a momentary advantage. The new rebuilt stealing system also creates far more accurate realistic situations where the ball might roll away in any direction causing the players to chase after it. You can also end up locked down with both players holding on to the ball resulting in a throw up, as well as successfully stealing the ball and breaking away to score in an open goal. We found stealing to be quite tricky in NBA 2K19 and as it offered quite random results (which you could argue is realistic) it became preferred to just defend and screen where necessary to prevent a foul. The lay-up shot meter has also returned after an absence last year, and now experienced players will find they’ll be able to nail their lay-up shots much more confidently. While the system still needs some work, each year brings about refinements and hopefully one day we’ll be scoring those uncontested 3’s that are often called contested by the game. Something that continues to grind our gears and arguably also keeps 2K’s coffers well stocked is the virtual currency that is riddled throughout NBA 2K19. There aren’t any loot boxes, but practically every customisation in-game costs virtual currency which you’re rewarded after completing different things throughout the game. Playing a full match rewards you with about 1,000 VC which isn’t very much, however you can splurge with real-life money to buy as much VC as you want. This leads to some people having huge head starts over others, and while you can gradually play the game over the course of the year and unlock everything you might want, by that stage the next NBA 2K game is almost out. It would be great to see more VC rewarded for actually playing the game so that it’s easier to enjoy the end-game content sooner. Not much has changed visually since last year’s game, but we did notice more attention to detail in animations, as well as some new animations altogether. The new neighborhood is looking nicer, and with the more open layout you can get a sense of togetherness as you chill and watch others shoot some hoops or join in the fun yourself. Facial expressions are done quite well throughout the cutscenes of MyCareer mode, but for some reason the pre-show commentary team still have weird depressed spaced-out expressions, Shaq included. The sights and sounds in NBA 2K19 basically match watching a real-life game on TV, however as usual the longer you play the game the more stale and repetitious the commentary becomes. A big thumbs up to Travis Scott this year, as he curated the game’s soundtrack which sets the perfect mood for shooting hoops, including songs from artists like Bruno Mars & Cardi B, as well as Fallout Boy and a few from Travis Scott himself. As each year goes by, 2K continues to build on what they have made, and this year NBA 2K19 gets one step closer to becoming the be-all end-all basketball game that fans crave. 2K19 offers basically every type of basketball option a fan could want, and just needs a little bit more tweaking to deserve the higher review scores. It looks like the neighborhood layout will be changing each year, but more customisation is needed in the open-world such as apartment upgrades and character design flexibility. It will be interesting to see how the NBA 2K games transition in to the next generation which is looking like it is just two years away. With new consoles comes new power, and we could see an open-world style of basketball the likes of which we haven’t even thought of yet. Rocket Chainsaw reviewed NBA 2K19 on a PlayStation 4 Pro, and it can also be purchased on Xbox One, Windows PC and Nintendo Switch. For more information, head to the official NBA 2K19 website here.